It is time to bake myself another loaf of sourdough. This sourdough french will start out in the bread machine, but finish in the oven. This is a time-consuming loaf, so I actually started late last night, by taking 1/2 cup of my sourdough started out of the fridge. In a glass bowl, I added 3 cups of flour and 3 cups of water to the starter, I mixed everything together with my dough whisk and covered it with a cheesecloth to reactivate. 12 hours later, my starter has woken up and I have a nice active sponge. I need 2 cups of the sponge for this loaf, so after I measure that out, I add another cup each of flour and water to the remaining sponge to keep it active. (I plan on baking another sourdough loaf when I am finished with this one, otherwise I would let it sleep again.) Into the pan on my bread machine, I put 1/2 cup water, 2 cups of my sourdough sponge, 2 teaspoons salt and 3 cups bread flour. After making a well in the flour, I added 2 1/4 teaspoons bread machine yeast. I set the machine on its dough cycle, and let it start. The recipe recommends a 3 1/4 to 3 1/2 cups bread flour, total, but that the baker should start out with 3 cups and add more as needed. The total amount used will vary depending on the consistency of your starter. The author also states that at this point the dough will be firm, then get shiny and soften. I slowly added more flour, until I was comfortable with the consistency of the dough. 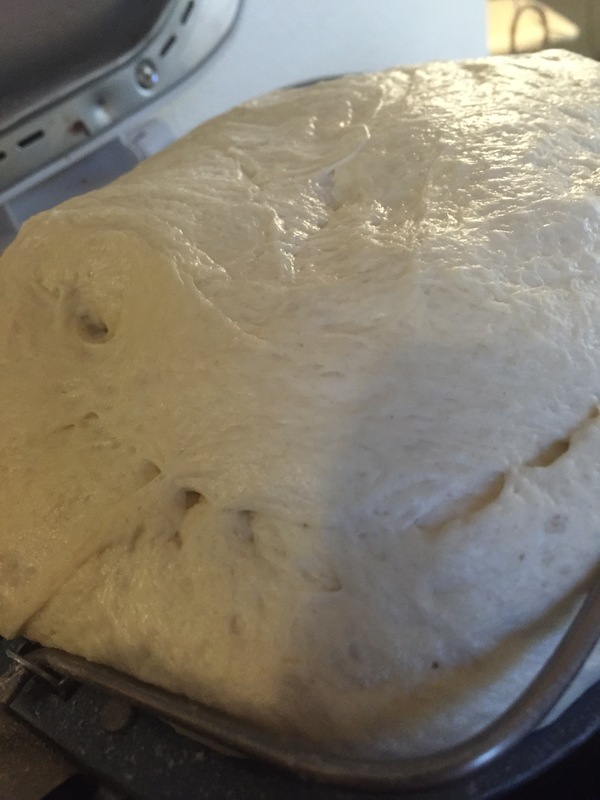 When the cycle ended, the dough had risen nicely. The next step, according to the book, is to “Gently deflate the dough with your finger.” Then I need to let the dough rest for another 3 hours in the machine. The author then states, “If it is rising slowly, I have left it in there for up to 8 hours.” Yikes, again, I will play it by ear. I set myself a timer for 3 hour and will check it at that time. I am glad I didn’t plan on the 8 hour rise. The dough was already touching the top of my bread machine at 3 hours. Next, I turned the dough onto my floured board. Here, the cookbook says to use a dough card to fold the edges to the center and create a round loaf. There must be a method to this that I have yet to learn, I ended up using my hands to shape the loaf. I added about a tablespoon of flour, during this process, to keep it from sticking. Then I spread a thick layer of flour on the work surface and turned the loaf to keep the smooth side face down in the flour. I covered that with a clean tea towel and headed to the grocery store. (At this point, the dough needs to rest for about an hour at room temperature, so this is the perfect time to run this errand.) Back from the grocery store, it is time to knead the dough into a tight round, deflating it again. Next, I got out my handy banneton basket again. After heavily flouring it, I placed the dough, smooth side down, in the basket. (Oh dear, I just heard that spoken by the actor in Silence of the Lambs, “It puts the dough in the basket or it gets the hose again!”) Oh well, at least I amuse myself. I tightly wrapped the entire banneton with plastic wrap and put it in the fridge. It is supposed to rise slowly, in the refrigerator for 12 to 24 hours. I will check it tomorrow morning and throughout the day as necessary. I let the dough rise in the refrigerator for about 15 hours. Twenty minutes before baking, I began preheating the oven to 450 degrees. While that was warming up, I lined a clean baking sheet with parchment paper and sprinkled that with a little bit of cornmeal. Once the oven was heated, I gently moved the dough from the banneton to the prepared baking sheet. 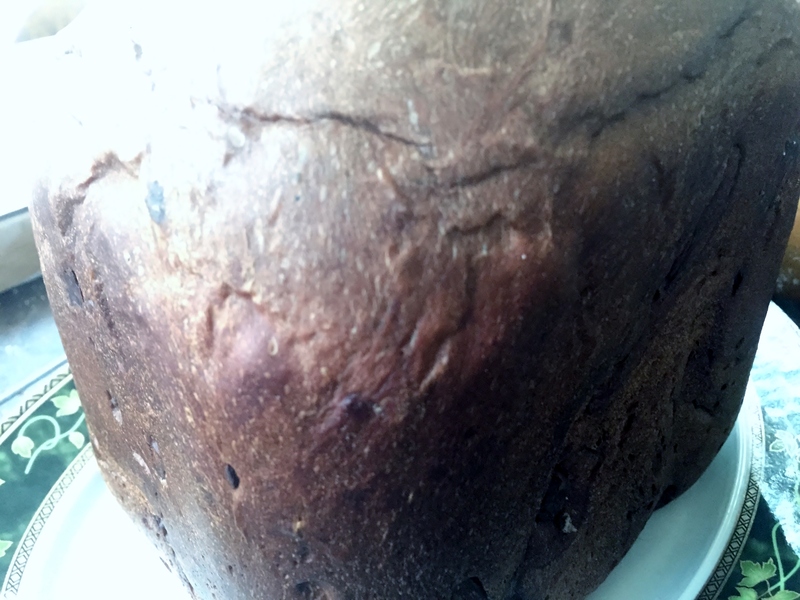 Then, using a sharp knife, I cut a cross hatch design in the top of the loaf, about 1/4 inch deep. I sprayed the outside of the loaf with a small amount of water and immediately put the loaf into the hot oven for 12 minutes. After the first 12 minutes were complete; I lowered the oven temperature to 375 degrees and allowed the bread to bake for another 25 minutes. The cookbook says to give it 25-30 minutes or until the crust is brown and the loaf sounds hollow when you tap on it. Last step, before eating of course, is to cool the bread on to room temperature on a rack. This loaf is not going to last long; it is delicious. The crust is crisp and crunchy while the interior is sour and chewy. 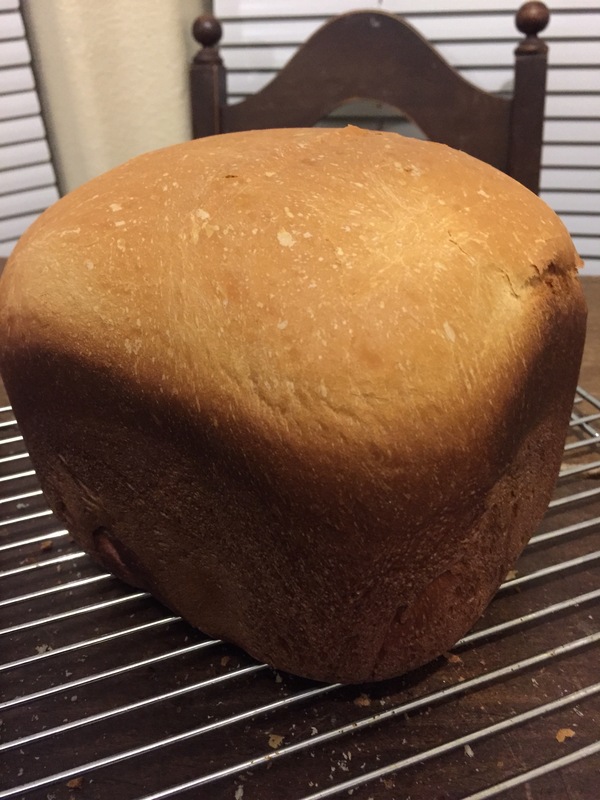 It tastes wonderful; I had a large hunk with butter for lunch and will now have to plan a dinner that will go well with this tasty, tasty bread. This is another loaf for my sister. I am making myself a loaf of sourdough French and decided to keep the starter active and bake a loaf for Becky as well. First thing I have to mention is that the title is misleading here. I am sure it must be an editing error; but there is no honey in this bread. The sweetener called for here is dark brown sugar. I considered substituting honey, but decided to follow the recipe as printed. Into the pan on my bread machine, I added 1/2 cup fat free milk, 1/4 cup butter, cut into pieces, 1 cup sourdough starter, 1 1/2 teaspoon salt, 1 cup bread flour, 2 cups whole wheat flour, 1/4 cup dark brown sugar, 1/3 cup sunflower seeds and 2 tablespoons chopped walnuts. After making a small well in the top of the dry ingredients, I added 1 1/2 teaspoons SAF yeast. 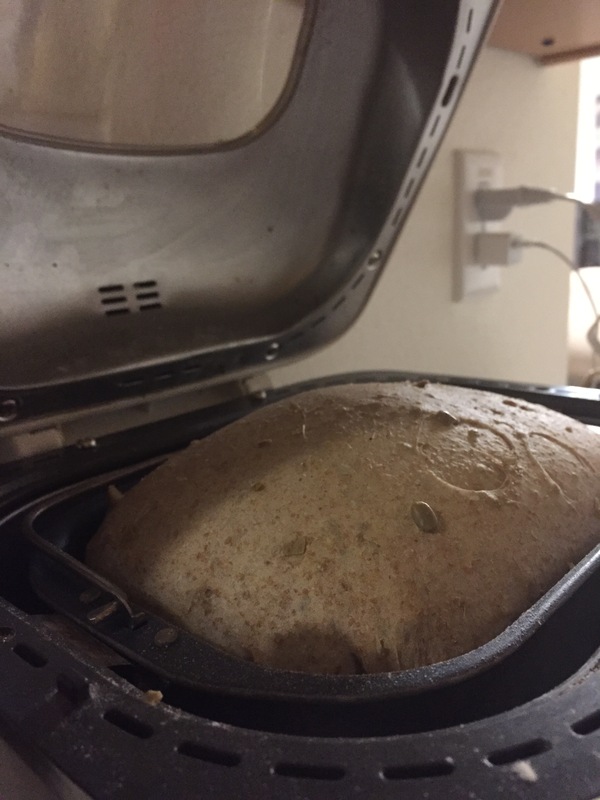 The loaf requires a dark crust setting and the use of the Whole Wheat cycle on my machine. I didn’t hover much on this one. Once or twice I checked on it and scraped down the edge of the pan with my rubber spatula, but I didn’t stress myself out adding sprinkles of flour and water, trying to “perfect” the dough. This was probably a wise decision on my part as the loaf is lovely. It rose nice and high, with tasty sunflower seeds dotting the exterior, I am sure the inside is just as lovely. I will ask Becky to take a picture of the loaf for me after it is sliced. On a side note, Becky had provided butter, this person just didn’t know. This one has me worried because that last chocolate loaf was such a fail, ah well, onward and upward. Mom will be home later this week and this loaf is for her. No, I cannot pronounce the title. I tried and I know I sounded like the American I am, “Pane awe Twa ParFuums.” Regardless, the is the bread of three perfumes. The “perfumes” in this loaf are the aromas of mint, chocolate and pistachio. Ms. Hensperger recommends serving each slice with a candied mint leaf. I tried candying mint leaves once and was not impressed with the results. Mom can serve this however she wants. This recipe calls for milk and I am out of my lactose-free milk, but had some vanilla almond milk. I will go ahead and use that, and hope it won’t negatively affect the loaf. I am also using peppermint bakery emulsion in place of mint extract. It substitutes exactly and the robust flavor is supposed to stand up better to the heat of baking. I already had it on hand, otherwise I would have used standard extract, though. Into the pan (all at room temperature) go: 1/2 cup vanilla almond milk, 1/2 cup water, 1 large egg plus one egg yolk, 3 tablespoons pistachio oil, 1 teaspoon mint emulsion (extract), 1 teaspoon salt, 2 2/3 cups bread flour, 1/4 cup sugar, 3 tablespoons unsweetened cocoa powder, and 1 tablespoon plus 1 teaspoon gluten. 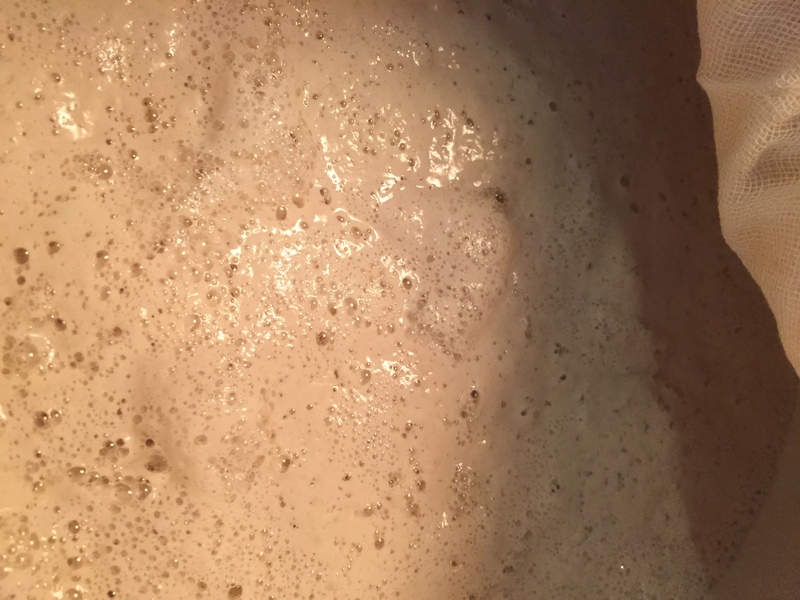 I made a small well in the center of the dry ingredients and added 2 teaspoons SAF yeast. When the machine alerted me between kneads 1 and 2, I added 1/2 cup bittersweet chocolate chips and 1/3 cup chopped pistachios. This really smells incredible, as it should. It is rising nice and high with a lovely round top. What the what? Even with all my “helicopter baking” on this one, it turned out gorgeous. It looks great and smells even better. I can’t wait for mom to try it so I can let you know what she thinks. !FAIL! 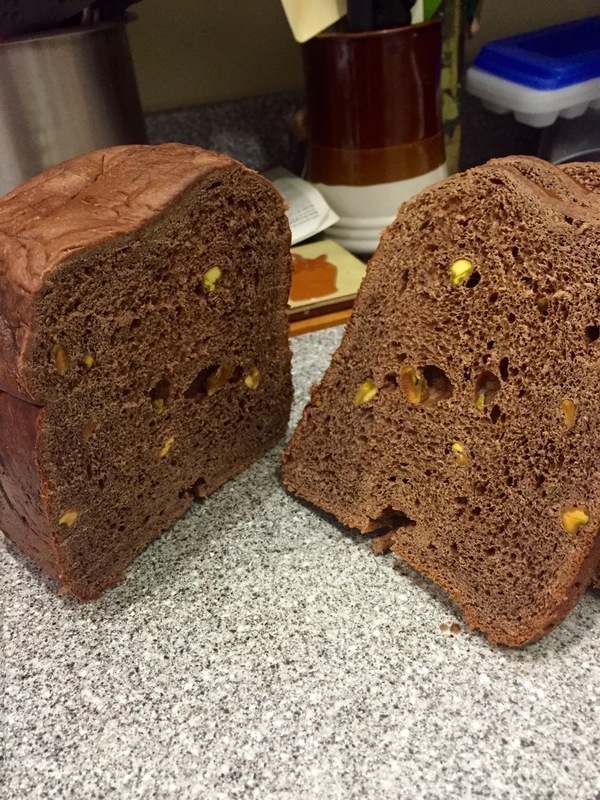 Chocolate Bread with Dates and Pistachios, page 493, June 19, 2015 !FAIL! Does this one sound exotic or what? I am making this loaf for my sister, since I will be seeing her next week. Our mom is coming back to town for a visit and I am baking her another loaf with pistachios, so this way, I can use them up and buy more room in the cupboard. My parents spent several years working and living in the Middle East and a bread like this makes me think of that part of the world. The flavors of date and pistachio make me think of deserts, date palms and camels. I forgot what a pain pistachios are, though. It’s a good thing I don’t care about my fingernails because they always look ragged when I am done cracking these things open. 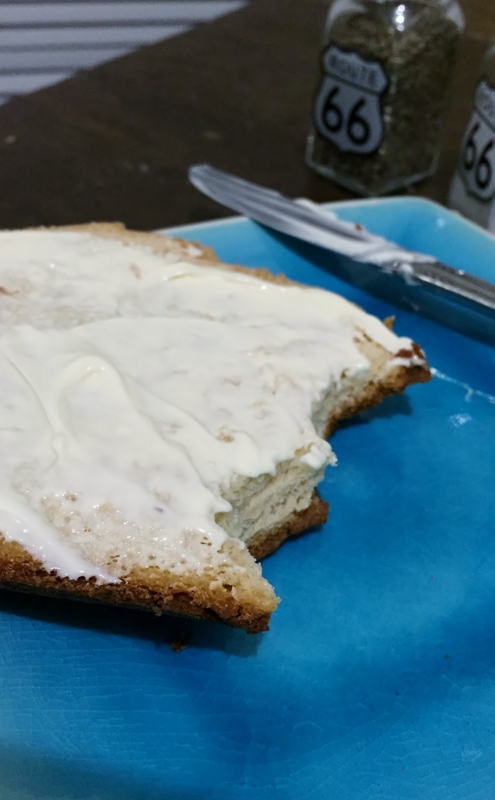 The author writes that this bread is best served sliced and spread with cream cheese. I may have to give Becky a heads up on that, in case she decides to take this one into work with her. Into the pan, I placed 7/8 cup room temperature water, 1 large egg, 3 tablespoons vegetable oil, 1 1/4 teaspoons salt, 3 cups bread flour, 1/2 cup sugar, 1/4 cup unsweetened cocoa powder and 1 tablespoon gluten. Using a small spoon, I made a well in the top of the flour and added 2 teaspoons SAF yeast. I am using the medium crust and sweet bread settings on my bread machine. When the machine beeps between Kneads 1 and 2, I will add 2/3 cup snipped, pitted dates and 1/4 cup chopped pistachios. It smells great, but doesn’t seem to be rising much. That may just be this type of bread. I will have to wait for Becky’s taste test to let me know if it is too heavy. This brick didn’t rise AT ALL. It was heavy and flat. I knew I didn’t want to inflict this one on anybody, so I broke it open to check out the interior, and it was still doughy. I am not sure if this is a fail on my part, a fail of the recipe or a fail of the sweet bread setting on my bread machine. Because I will be baking another sweet loaf in a couple days, I will hope to have a better understanding of the problem, then. Yeah, not even going to post a picture of this doughy mess. It is not even fit for the birds. Anyhow, go big or go home, so I am making ravioli out of my pasta dough. I put together a filling using leftovers from pizza night, goat cheese, eggs, a little ricotta, Parmesan, ground beef, salt, pepper, and fresh chives and oregano from my plants on the back porch. I will toss it with some leftover pesto when it is done. To get the mood right, I even have my “Italy” music on; Dean Martin and Puccini. There is no wine in the recipe, but I am thinking I ought to drink a glass, just to calm my nerves. What a goofball I am being. Wait, it gets worse, I have no wine in the house, this will have to do: Alright, my bread machine actually has a pasta dough setting, which is nice. Into the machine go 7/8 cup warm water, 1 tablespoon olive oil, 2 cups bread flour, 1 cup semolina pasta flour and 1 teaspoon salt. The instructions in the cookbook are to start the cycle, set a kitchen timer for 7 minutes, then check the dough. If it is too dry, add more water, a few drops at a time, while it is kneading. If it is too moist, sprinkle in some flour, a teaspoon at a time. Then I will need to reset my kitchen timer for 3 more minutes. When the time is up, stop the machine. 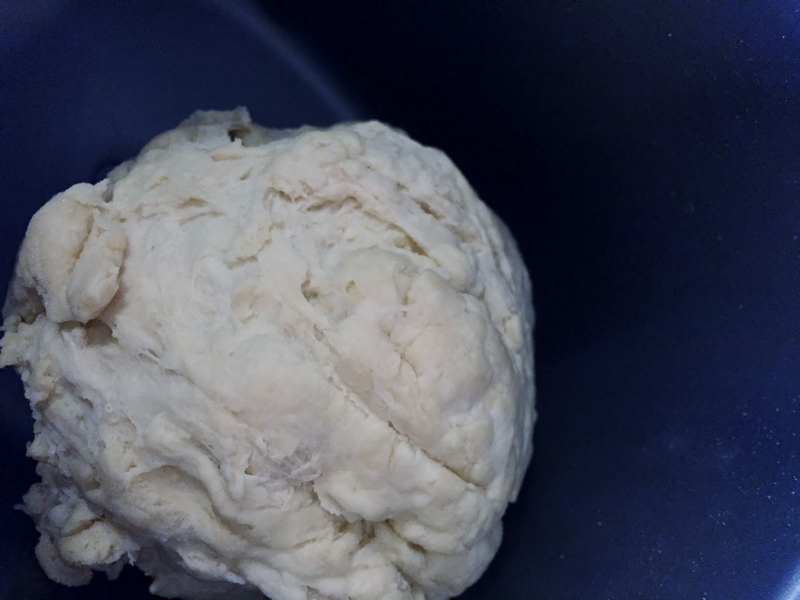 When I checked the dough at 7 minutes, there was quite a bit of flour mixture that hadn’t melded to the dough ball. I added water, just a few drops at a time, until there was one ball of dough. Next, I separated the dough ball into 4 portions, leaving the sections I wasn’t using covered by the saran wrap as I worked. I picked up a small hand-cranked pasta roller/cutter at the thrift shop and will certainly be putting it to use today. There are thickness settings and I need to gradually bring my sheets of dough to the thinnest setting possible. The instructions I found online are to use the widest setting three times before decreasing the width. I found I needed to dust the sheet with flour regularly and work diligently to keep it from sticking to itself. 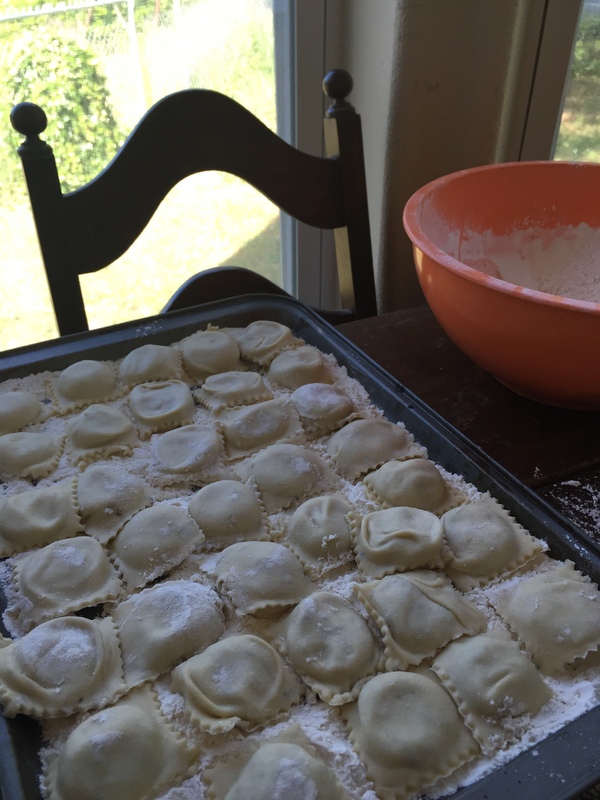 I have a small ravioli mold that I laid a sheet of pasta across. Then there is another piece to the mold that creates the “pockets” for a small amount of filling. I spooned a small (maybe half tablespoon) amount of filling into each pocket. I then topped the mold with another sheet of pasta, and ran my rolling pin across the top to seal them together. Then I used a knife to separate the raviolis. 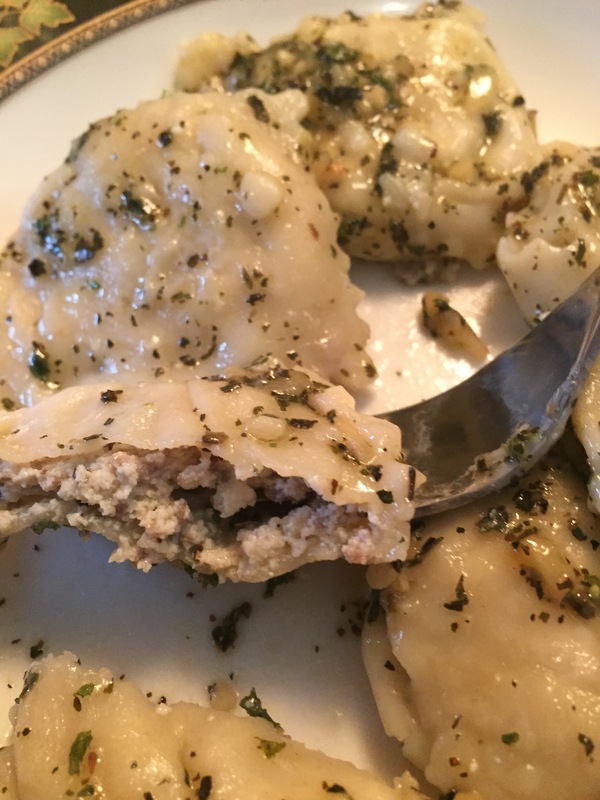 The raviolis need to be set on a heavily floured cookie sheet to dry for one hour. Then, they need to be flipped over and dried for another hour. At this point, I am going to cook them, although they could be frozen for future use, if desired. Wow, this would have made a LOT of raviolis, I decided to do some ravioli and cut the rest into fettuccine to dry and use another time. So, I used 2 of the dough portions to make fettuccine. First, I used the rollers to get th e dough sheet thin enough, then used the fettuccine setting to cut my pasta. 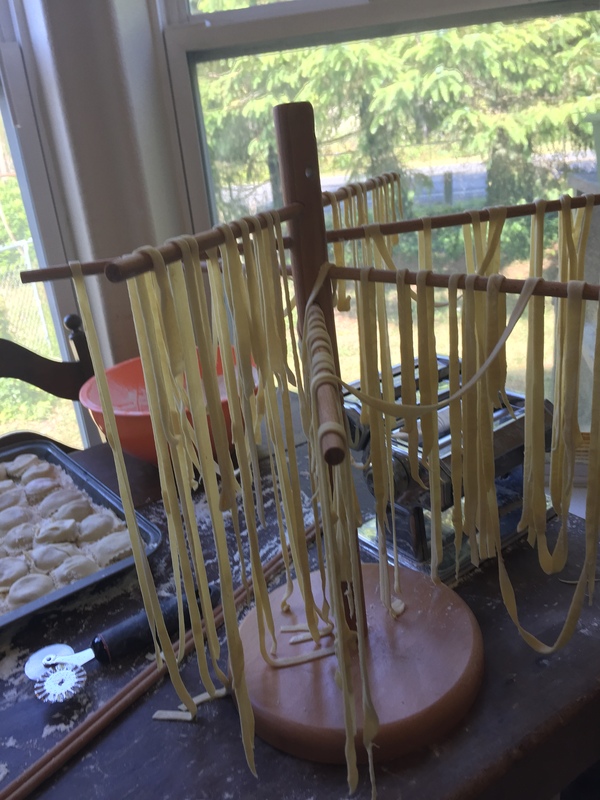 I laid my noodles across the dowels on my drying rack. I haven’t even gotten close to ready to cook these things yet and I think my nerves were misplaced. So far, the process hasn’t been too difficult. I have enjoyed it. What I SHOULD have been nervous about was the mess. There is flour on my table, flour on my floor,clothes, face, I saw some in my hair and know wherever the cat ended up, she must have some too because I see floury paw prints here in the office. This is going to be a cleaning nightmare. 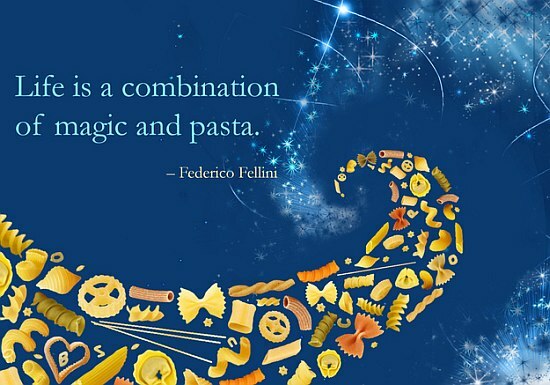 But if the pasta tastes good, I will have learned to do something I have always wanted to be able to do. That will make it worth it. One thing, my readers and friends, if you happen to have an old Italian grandmother who has been making fresh pasta for her family all her life, please don’t show her this. I know it would break her heart, and her reaction might break mine. I was in a play, several years ago and had to speak with a Cockney accent. One of the other actresses had invited her British granny to the show and afterward she let me know, in no uncertain terms, that mine was the WORST Cockney accent she had ever heard. Ouch. I already know this attempt at pasta making would fall short of your Great Aunt Sofia’s method. Save us both the grief by not sharing this with her. After the raviolis had dried for two hours, I started water boiling in a large pot, I added some salt and olive oil. The instructions say to boil the ravioli for 8 minutes, but that the time should be adjusted based on the thickness of your pasta. I decided to go with the suggested time. Once the water was gently boiling, I added the pasta and returned it to a boil, starting my time then. I kept a close eye on the pot, because I was worried that too hard a boil m ight cause them to break open. After the 8 minutes were up, I drained the raviolis and returned them to the pot to toss with my pesto while it warmed back up. They look a little like wontons to me. 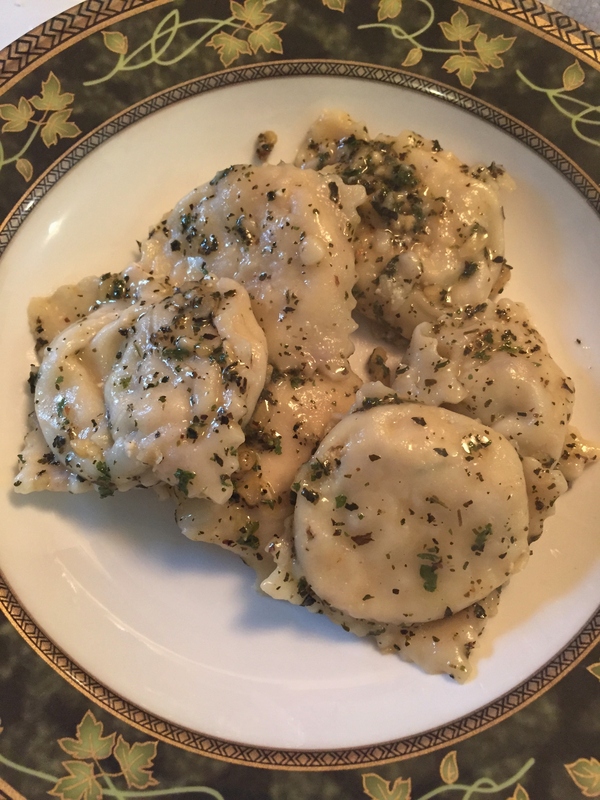 They just don’t look as “puffed up” and uniform as the ravioli I have had in the past. They taste incredible, though. The pasta is tender, but not mushy and the pesto topping pairs w ell with the milder filling. While I like the taste enough to wish I had company here to share it with, the garlic breath I have going on right now is enough to remind me that I am glad to be home alone this evening. When the fettuccine is completely dry, I will put it in an airtight bag and store it in the refrigerator to cook later this week. I will come on and amend this post after I have tried that. 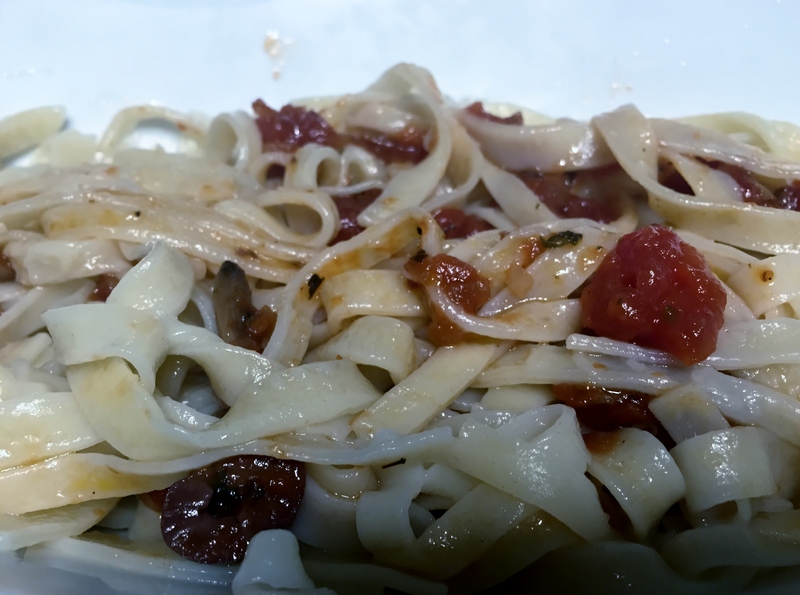 June 17 – I didn’t wait too long before trying the fettuccine; the roast I had planned for dinner tonight wasn’t fully thawed yet, so I cooked up some of the fettuccine I made yesterday. I added the noodles to boiling, salted water with a little olive oil. After gently boiling for 4 minutes, the noodles were al dente and I drained them before tossing with a mixture of tomatoes, caramelized garlic, kalamata olives and olive oil that I made a while back. The dish was really yummy; and filling. The noodles held u p well to the “sauce” and were perfect, a slight bite, and not mushy. I am no where near a pasta making pro, but at least I can say I have conquered my fear, and learned something new. I ended up staying home this weekend and as I am finally feeling able to get around, I though it was time to bake another loaf for gifting. I will be taking this Granola Bread (along with a jar of the Caramel Apple Jam I made last year) to the Oceanside Animal Clinic in Seaview. They have been so supportive, and I know they truly care about my fur-babies. I have to go in to the office on Monday and will take them some bread as a thank you for being so great. Granola is another one of those great things that I can’t eat. Luckily, I was able to find some in the bulk bins at the grocery store, so I only had to buy the amount I needed for this recipe. Ingredients for this loaf are: 1 1/8 cups buttermilk, 2 tablespoons vegetable oil, 2 tablespoons honey, 1 1/2 teaspoons salt, 2 1/8 cup bread flour, 1 1/4 cups granola (the granola I bought contains cranberries, coconut, raisins, almonds, walnuts and pecans), 3/4 cup whole wheat flour, 1 tablespoon gluten, 1 teaspoon ground cinnamon and 2 teaspoons SAF yeast. I am using the Medium and Basic settings on my machine for this loaf. This loaf rose up nicely and has a wonderful cinnamon scent. I decided to slice this up and deliver it on a plate. 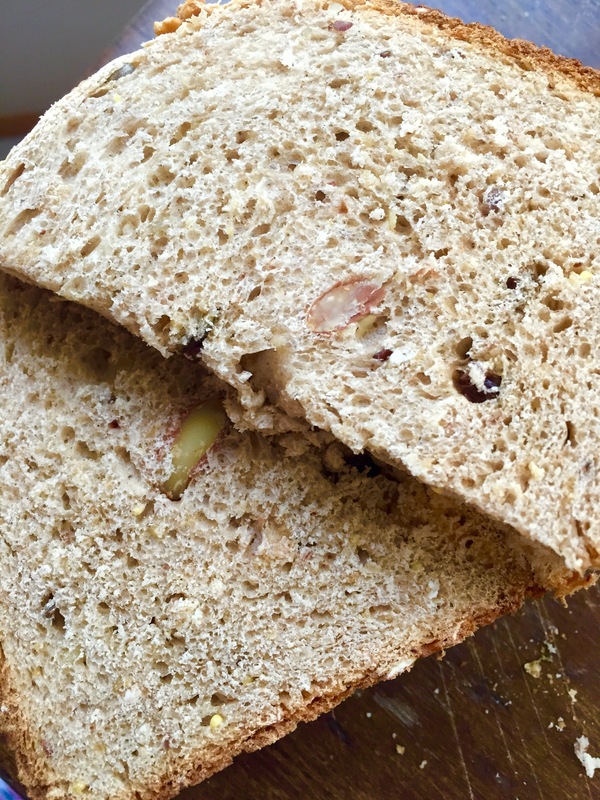 As you can see, bits of nuts and dried fruit are visible throughout the loaf. 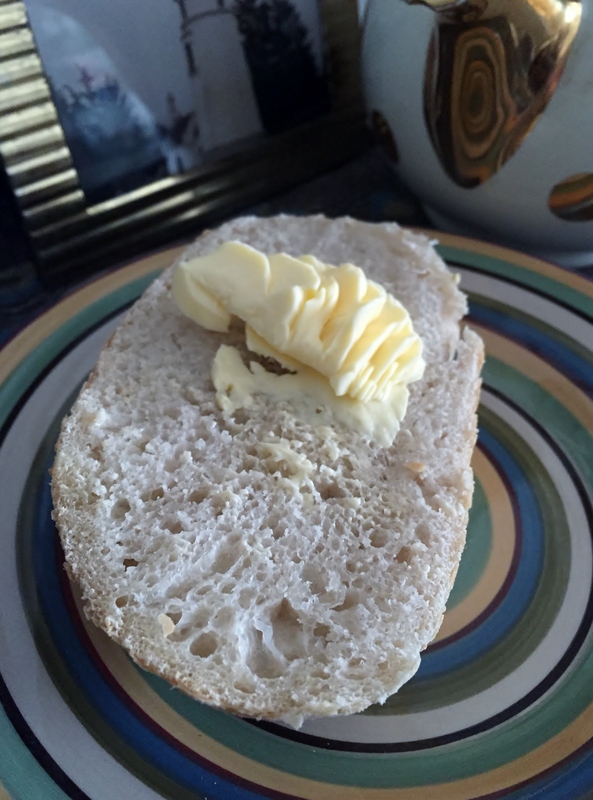 The texture is soft, but the bread is on the heavy side. I will ask them to give me their thoughts. They were so great, they even washed the plate for me when they were done; that wasn’t necessary. They did let me know they are willing to act as guinea pigs again whenever I need them too. Thanks again, to the staff at Oceanside Animal Clinic. You all have been so wonderful, and continue to be. The title of this one just makes me hungry. It is time for another loaf to have here at home and this is the recipe I have chosen. 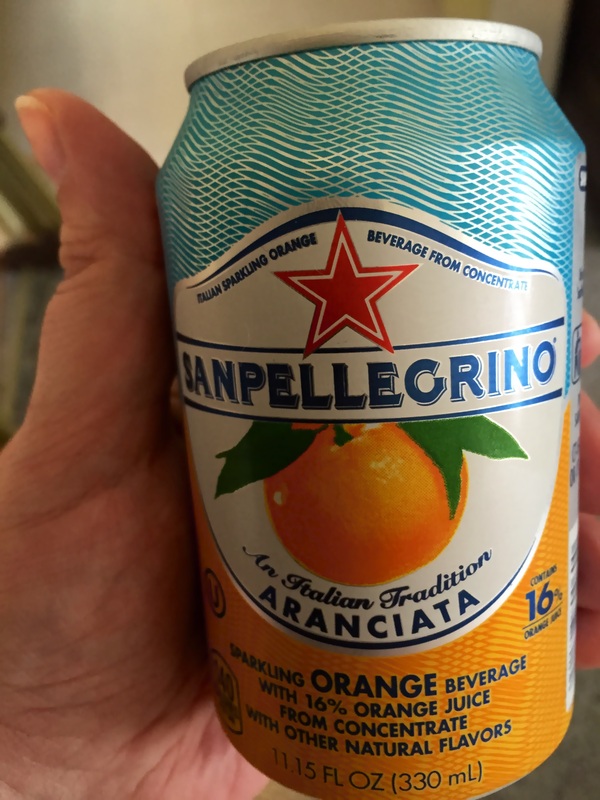 I am not a big beer drinker, so I am just using a can of Rainier I found in the fridge. I imagine you could try this recipe with different combinations of beers and cheeses, and find a combination that best fits your taste. I am also using a sharp cheddar cheese, although the recipe suggests a mild cheddar or Colby. The author described Colby as, “a cheese known for its firm texture.” In case the texture was the reason she recommended it, I froze my cheddar shreds before putting the dough together. The beer also needs to be flat prior to putting the dough together, so I opened the can and let it sit out on the counter for a few hours. After my research earlier today into the possible reason behind my recent string of crater loaves, I am adding my ingredients into the pan like this: 1 cup (8 ounces) flat beer, 3/4 cup shredded cheddar cheese, 1/4 cup sugar, 3/4 teaspoon salt, 3 1/2 cups bread flour and 1 3/4 teaspoons SAF yeast. I made a small well in the center of the flour and put the yeast into the we ll. 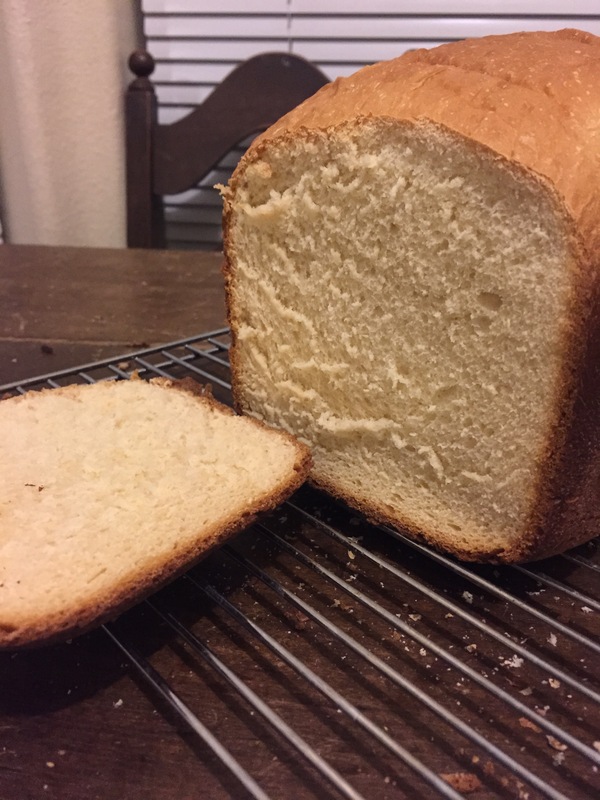 Ms. Hensperger describes this bread as rich “like a pound cake.” With the amount of sugar in the recipe, that does not surprise me. The pungent, tangy smell of the beer is already filling the kitchen. I have high hopes for this loaf. As the bread begins baking, the cheddar smell is now more predominant than that of the beer. Now, THAT is what I am talking about. A nice, high loaf with a smooth rounded top and a lovely golden brown color. I have to wait for it to come to room temperature before slicing it. Tick Tock Tick Tock. . .
Oh yum, oh yum yum yum yum yum. This bread is delicious. It is indeed rich, the beer adds a wonderful aroma and there is just enough cheese to flavor the loaf, without being overwhelming. I don’t taste the sugar, I have had beer breads before that are very sweet, this one is not. The bread itself is tender, and slices easil y. The golden brown crust is crunchy and flaky.